Running is one of the most popular sports exercises. It is not just about doing the healthy thing, but also about having fun. But sometimes, there are a number of things that can stand in your way to achieving the best experience. One example, your smartphone. Almost all of us would have this problem of struggling to carry your mobile accessories while running. Ths is just what Kickstarter Smart Performance Running Shorts offers to help. We already know how tough it can be to keep and hold your phone in your hands or in your pocket. Not to mention some of us love to listen to music while you run. Unpleasant experience. Your phone is probably just going to fall off the pocket or until get your palms tired, making your running not quite as exciting as you would have wanted. The new generation of people loves HUGE social connection. It’s a habit nearly all of us have formed and don’t want to let go. Whether you are going to the gym or the college or the mall or just anywhere else, you want to have your phone with you. And doing sport is not an exception. Neither is any other sport. The Kickstarter special performance shorts can let you do just that. Designed with just the features you need for these to be, these shorts come with great function, convenience, and fun, all in one pack. Kickstarter Special Performance Shorts (SPS): What Are They? The Kickstarter Special Performance Shorts are comfy running shorts designed to let you have a better running experience. Special features are included to hold your phone accessories and make sure that you can have much convenience as you want. For instances, it holds your phone, keys, earphone and even your wallet can now go with you on your run. Read on and learn more about these shorts. These special performance running shorts come with ergonomic inner tights which include special pocket design for you to keep your smartphone in. These thoughtful inner pocket are also designed to fit comfortably and perfectly tight in which your essential will never fall out while you run. There is a special earphone slot organizer through which you can comfortably thread your earphone wire and enjoy your music without having to deal with wires getting in your way. In addition, these running shorts come with a back pocket designed to keep your essentials safe and sound. You can also use this pocket to keep your keys and other small items. Plus, they also have a good fit to make sure that you do not experience any inconveniences on your run and that your stuff does not fall out. In fact, you do not even have to feel them being there. If you are going to have a night run, these shorts will serve you just fine. Features have been included for this purpose. These shorts include reflective details to keep you safe and also to make sure that it can be seen under low visibility. This way, you can see and also be seen as the reflective details illuminate. There is a waterproof inner packet where you can keep your stuff, your phone especially, from getting wet from sweat or water. This is another very essential feature, as you do not want your stuff getting drenched. In addition, these shorts include a four-way stretch inner tights to prevent your thighs from rubbing against each other and causing a chafing. This can also be a very uncomfortable experience which will make your run tough and unexciting and which you would not want to have. These running shorts can very well save you from this. These inner tights are also designed to be anti-bacterial and anti-odor. Perfect addition to running shorts. Of course, we know that running means you are going to sweat a lot. The anti-odor feature has been included so you do not have to bother with any unpleasant smells. And yes, they keep the germs away too. These shorts are designed with a snug, body-hugging materials to ensure that they are fitted enough to protect your stuff from falling out. 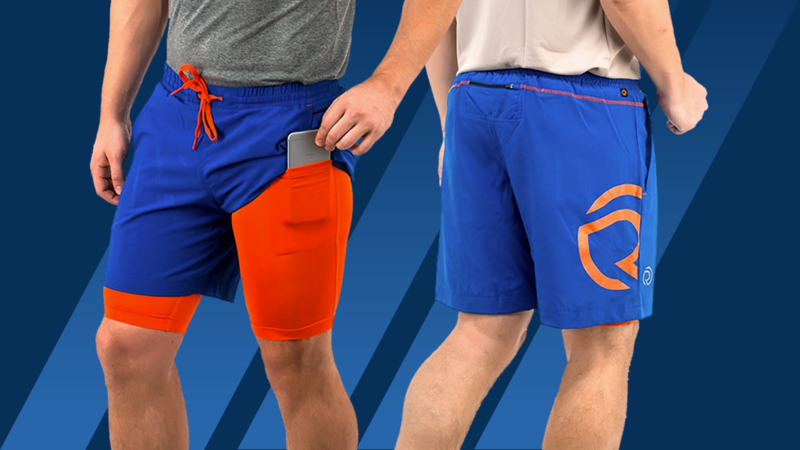 The shorts are also designed with your security in mind even and especially when you are running at night. With them, you can have a very safe and comfortable night run. They allow you to have an exciting and comfortable run. You can carry the simple accessories you would love to have on your trip and not worry about getting weighed down by those. 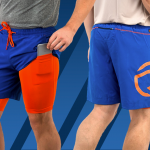 With these shorts, you are protected from having to deal with the inconveniences of bad smells that can, of course, come with running, workouts and many other outdoor activities. They are designed to keep your items safe as you run, workout, cycle or do any other sports. You are protected from the risk of losing your stuff since you will have them very close to your body. And you too are provided with sufficient security. They are a waterproof column to keep your stuff protected from coming in contact with moisture and probably even getting damaged. It gets you the option of carrying your simple daily items around with you. Wha is more? These shorts are designed such that you can easily slide your phone into the inner packet from the outer pocket. 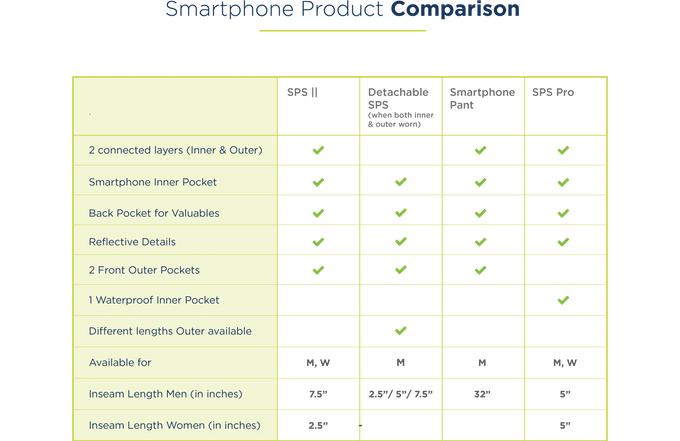 So you do not need to take up or take out the outer shorts to reach your phone or put it in. The inner tights do not come with zips which can be quite a challenge, especially during cycling as your phone could potentially tend to fall out. The inner phone packet does not have a very strong hold at the waist and this can be difficult with the weight of the phone pressing down the tight. Some people have complained that the inner tights are loosened and can come off because of the elasticity. The Kickstarter special performance running shorts are, in all, a great choice for any sort of sport. From running to workouts to badminton and just about any other sport, these shorts will serve you perfectly. You will love how they let you do your sport comfortably and keep your stuff securely locked. Not suitable for heavy items.